The New Yorker has a long article on Mackey which was a very good read. Since it is so long I’ve summarized what I found interesting from it below. I’m terrible at summarizing and in college never got into highlighting my textbooks. When reading I either found it all really interesting or all really dull so it was either all yellow or remained all white. So the fact that I have summarized lots of text below should tell you a lot about what I thought of the article. A year ago, Mackey came across a book called “The Engine 2 Diet,” by an Austin, Texas, firefighter and former professional triathlete named Rip Esselstyn. Basically, you eat plants: you are a rabbit with a skillet. Mackey had been a vegetarian for more than thirty years, and a vegan for five, but the Engine 2 book, among others, helped get him to give up vegetable oils, sugar, and pretty much anything processed. He lost fifteen pounds. Mackey sought succor in spiritual practice. He engaged a friend, a follower of the Czech transpersonal psychologist Stanislav Grof, to guide him through a therapeutic session of holotropic breathing. “I had this very powerful session, very powerful. It lasted about two hours,” Mackey said in an inspirational CD set he released last year called “Passion and Purpose: The Power of Conscious Capitalism.” “I was having a dialogue with what I would define as my deeper self, or my higher self.” He had a pair of epiphanies, one having to do with severed relationships that needed healing. The other was that “if I wanted to continue to do Whole Foods, there couldn’t be any part of my life that was secretive or hidden or that I’d be embarrassed [about] if people found out about it. I had to let go of all of that,” he said. “I’m this public figure now.” He couldn’t “embarrass the company,” he told me. “I have to grow up”—he is fifty-six. “I can’t have affairs with women. One of the things that happened was you have more money and you have more opportunities for such things. And those are sort of off-limits. “I was so viciously attacked for two reasons,” Mackey told me. 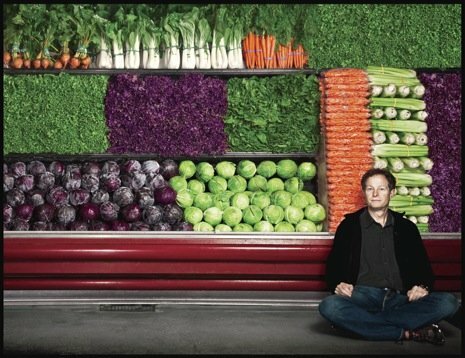 “One is that people had an idea in their minds about the way Whole Foods was. So when I articulated a capitalistic interpretation of what needed to be done in health care, that was disappointing to some people.” He begrudges the extent to which people have projected onto Whole Foods an unrealistic and idealistic vision of the company. “The C.E.O. of Safeway, Steven Burd, wrote an op-ed piece in June advocating, basically, market solutions to the health-care problem, and nobody gave a ****,” he said. He went on to Trinity University, a small school in San Antonio, and the world flowered before him, as it did for so many in those days. “I was reading a lot of philosophy and religion,” he said. “And I did a lot of those experiments that young people do when they’re in college. I’ll not name those. In 1978, with forty-five thousand dollars from friends and family, he and his girlfriend at the time, Renee Lawson, decided to start a store of their own, which they called SaferWay—a takeoff on Safeway. The store was on the ground floor of a Victorian house; they lived on the third floor and ran a small restaurant on the second—a rustic prototype for today’s prepared-food extravaganzas. The house didn’t have a shower, so they bathed in the store using the hose from a dishwasher, a creation legend that the company holds dear. He soon noticed that a number of much bigger natural-foods stores had sprouted up around the country, such as Mrs. Gooch’s and Frazier Farms, in California. He persuaded Craig Weller and Mark Skiles, the owners of a store called Clarksville Natural Grocery, to merge with him and Lawson (in part, by implying that he might put them out of business), and, in 1980, the four of them opened the first Whole Foods, in a former night club. It was ten thousand square feet. They stocked not just lentils and granola but, in contravention of the co-op ethos, indulgences like meat, beer, and wine; there were aisles full of five-gallon bottles of distilled water, to avoid the embarrassment of empty shelf space. The idea was to go beyond the movement’s old tofu severity, the air of judgment and self-abnegation. Their version of decadence seems Spartan now, but at the time it represented a cultural shift. The first Whole Foods thrived, with a setback or two. (Another cherished legend: in 1981, a flood inundated the store with eight feet of water, and a battalion of customers helped the founders clean, repair, restock, and reopen it.) It became something of a local hot spot. “I did all the hiring the first five years,” Skiles said. “I had a field day, man. They built two more stores in Austin and expanded to Houston and Dallas. Then they bought a store in New Orleans called, of all things, Whole Food Company, settling on a strategy of buying existing stores in pursuit of a kind of nationwide Pax Austinia. The owner of the New Orleans store, Peter Roy, eventually became the company’s first president. Next came Palo Alto, which happened to be next door to a good deal of venture capital, and Mackey and his partners spent months plying Sand Hill Road. Of the twelve V.C.s they went to see, all but three turned them down. As Mackey recalls in “Passion and Purpose,” “One of them said one day: ‘You know, I really think you’re just selling hippie food to hippies. I gotta tell ya that I don’t think it’s gonna work. But if it does work, Safeway’s gonna just steal it from you and you’re not going to be able to exist anyway.’ ” Mackey, for one, always feared that Safeway, or some other big chain, would do just that, but for a long time it did not. After the successful opening of a Chicago store, in 1991, the company went public, and embarked on a company shopping spree. Mackey is an example of what you might call the auteur C.E.O. Like Steve Jobs’s, his personality is entwined in his company’s. He doesn’t bother with day-to-day operations; he’s not a technician or a face man. When he’s asked what it is he does, exactly, he describes a kind of philosopher-king, who brings big ideas to bear. Mackey, an outspoken critic of executive overcompensation, pays himself a dollar a year. No one at the company can have a salary more than nineteen times what the average team member makes (On average, an S. & P. 500 C.E.O. makes three hundred and nineteen times what a production worker does.) Last year, the highest salary went to Walter Robb, the co-president and chief operating officer, who made just over four hundred thousand dollars (supplemented by a bonus and stock options). The average hourly wage was sixteen dollars and fifty cents. Whole Foods has made Mackey a wealthy man. He owns roughly thirty million dollars in stock—less than one per cent of the company—and has sold millions more over the years. Still, he flies commercial and drives a Honda Civic hybrid. He has houses in Boulder and Austin, and a seven-hundred-and-twenty-acre non-working ranch an hour outside of town, where he and Deborah spend many weekend. I asked him whether he’d given thought to what might come after him. “I don’t have any plans to leave anytime soon, no matter how much the unions would like me to,” he said. Talk turned to food, as it often does. “You only love animal fat because you’re used to it,” he said. “You’re addicted.” He urged me to consider reprogramming my palate. He also suggested that I try Grofian breathing.